How to Install Bar Rail: This brief video will show you how to properly miter cut and install Chicago style hardwood arm rail molding. This stuff is wicked expensive, so do it right the first time. 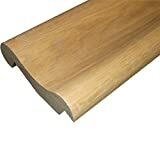 A single one foot section is about $12.50 depending upon wood species. Hardwood arm rail molding gives your bar patrons a comfortable place to rest their elbows. Chicago style arm rail provides a professional finished look to your home bar project. 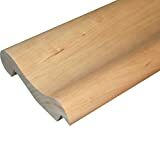 Please don’t try installing this pricey wood product without thoroughly understanding how to properly orient the arm rail molding in the saw before you cut. The spoil board orients the molding as it will sit when finally installed and is key to correct installation. Arm rail profiles vary from manufacturer to manufacturer so make sure your bar top will accept the profile you select. 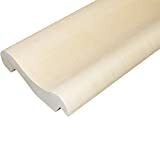 You can buy this type of arm rail molding from several sources, or you can follow our EMBP-06 to fashion your own (from a softer species of wood, like pine) and save a considerable amount of money. Video provided by Hardwoods Inc.